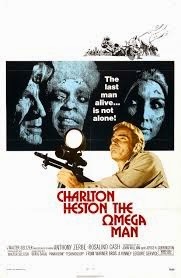 So after the 1964 movie The Last Man on Earth, it was not long before a more Hollywood style movie appeared, filmed and set in Los Angeles in the seventies, just like in the novel . So grab you 70's retro fashions we are watching. Much of the storyline has changed in this version. Neville is now an biowarfare scientist and in the military which gives him access to a test vaccine that grants him immunity from the plague. Now a virus. There is no backstory about his family so he appears as a bachelor living in his classy apartment equipped with state of the art gear, like a vinyl record player. And just admire the groovy fashions we had back then! I particularly loved his brown leather utility belt equipped with chunky flashlight, tape record and other tools. Really complemented his safari suit. This is more of an action movie. Neville’s apartment is equipped with sandbags, barbed wire and machine guns. He battles with “The Family”, a new social order of infected humans. The Family are just out to kill Neville, which borrows from the original novel. There are no vampires in this version but for the first time there are other humans who have not succumbed to the disease. In a bid to make it current with the times (back then) these human survivors include the African American woman Lisa and the counter culture medical student Dutch. The dialogue is filled with the African American and hippy slang of the time. In the end Neville dies but due to his immunity he gives the human survivors a chance to live. Humanity is saved. Yay! Wikipedia cites this movie as Tim Burton’s favourite, being one of the first movies to feature cheesy one liners. It is also the first movie to feature an interracial kiss. Without CGI, I was impressed how they managed to film panoramas of an empty deserted Los Angeles. This movie is available on DVD and I paid the extravagant price of $10 to own a copy. Bite off more one liners than you can chew.